TMP printed circuit board (PCB) lamination presses lead the industry in advanced engineering and system innovations. Our Hydraulic Vacuum Press systems come in a large variety of standard and custom sizes and capacities to fit your needs. Specialized heated platens, up to 1200°F, allow high temperature lamination for maintaining homogeneous material properties. Our Edge Advanced Control System gives you flexibility in your processing by allowing process parameter monitoring, recipe storage at press, real time data storage and other custom recipes with selectable sheet sizes. Should your requirement be research/development or daily production, the TMP press offers lower energy consumption, ease of operation, accuracy and dependability. Contact us for more information about our lamination presses. 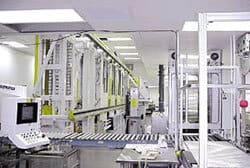 Read a case study on on how we developed a multi-purpose, 300-ton automatic hydraulic lamination press system for the printed circuit board industry.